NEW YORK (CNS) — The crime drama “Run All Night” (Warner Bros.) can be viewed as a Catholic-inflected redemption story. Even as it showcases some fundamentally positive values, though, director Jaume Collet-Serra and screenwriter Brad Ingelsby’s acrid film garners such a high body count and traverses so gritty an urban landscape that their tale of conversion winds up being too sordid for the casual moviegoer. 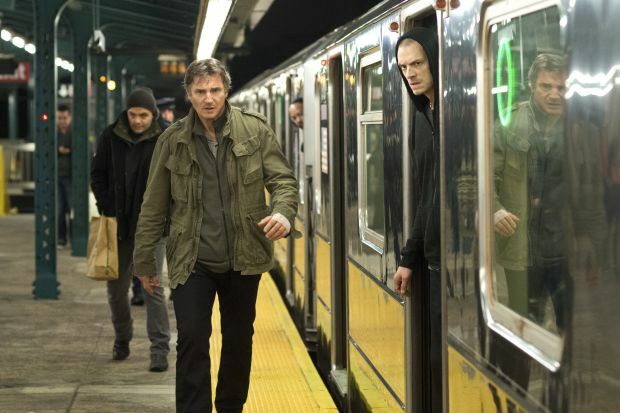 Liam Neeson stars as burned-out New York hit man Jimmy Conlon. While he may have escaped legal retribution for the long-ago string of rub-outs that gained him the tabloid nickname “The Gravedigger,” Jimmy is a remorse-driven drinker dependent for survival on the charity of his lifelong friend and underworld patron Shawn Maguire (Ed Harris). The casualties of Jimmy’s killing spree, undertaken at Shawn’s direction, include his relationship with his law-abiding son Mike (Joel Kinnaman) from whose family — Genesis Rodriguez plays Mike’s wife Gabriela — Jimmy is completely estranged. Yet when Mike, a limo driver, is targeted for death after accidentally witnesses a multiple murder carried out by Shawn’s headstrong son and heir Danny (Boyd Holbrook), the lad has no choice but to turn to Jimmy for protection. With both crooked cops under Shawn’s control and the city’s honest chief of homicide, Det. John Harding (Vincent D’Onofrio), on their trail, Mike and Jimmy go on the run. The chase becomes even more challenging for the duo once Shawn adds ruthless gun-for-hire Andrew Price (rapper Common) to the array of adversaries hunting them. Initially resigned to his own damnation — he and Shawn talk in oblique terms of their shared eternal doom — Jimmy eventually comes to yearn for some measure of personal salvation. He’s also shown to be at pains to keep Mike on the right side of the law and, in particular, to prevent him from spilling blood. Along with the odd religious detail, such as a crucifix or a portrait of St. John Paul II hanging in the background, a consistent theme of confession, though it’s rendered in purely secular terms, reinforces the vaguely Catholic context of the proceedings. As for the possible aesthetic rewards awaiting those adult patrons for whom this frequently visceral odyssey is suitable, the yield on that score is more routine than abundant. The film contains much harsh and sometimes bloody violence, drug use, a few vulgar sexual references, about a dozen instances of profanity and twice that number each of rough and crude terms. The Catholic News Service classification is L — limited adult audience, films whose problematic content many adults would find troubling. The Motion Picture Association of America rating is R — restricted. Under 17 requires accompanying parent or adult guardian.